You may remember I mentioned the other day, that the 2-foots had bought us a brand new cardboard playhouse. We could not really keep the old one, as we had decorated it for Christmas, so now we have a brand new sparkling clean one, which I am very pleased with. Flopsy Girl however is a different matter. She was ok the first day, but then last night she said "Dandy, I miss the skylight we had in the other house, and there were other nice features too like enlarged openings". Of course you know what this means don't you? 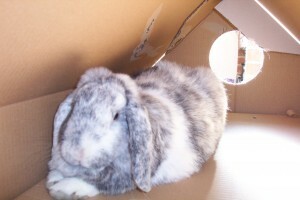 We have hardly got over Christmas, and Flopsy Girl wants me to start decorating AGAIN! Women bunns are never happy. Take the new Bobbin although she is very lovely if she has a dirty hutch and our 2-foot goes to clean it, she's none too happy, likewise once Bobbin has a lovely clean hutch, she's none too happy. What is it with these wobunns? Love - Loppy, TiGgEr, Mister Jingles, Honeybunny and Bobbin. PS - We hope the decorating goes well. Whenever I bring up that subject with Flopsy Girl, all she says is "Don't bother me now Dandy, I have a headache". Keep on trying. I'm sure that in the end they will appreciate what you are doing for them.